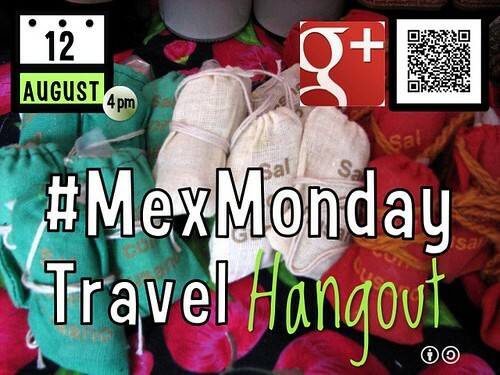 Planeta.com’s next #MexMonday Travel Hangout takes place Monday, August 12, from 4-5pm Mexico City time and will focus on Mexico. Planeta’s Mexico hangouts are unscripted conversation mostly in English and a smattering of Spanish and indigenous languages. Prepare to be adventurous and learn new words and phrases like yakxon and baax ka walik. Questions are welcome before and during the livestreaming hangout. We pay special attention to the tweets on Twitter that have used the #MexMonday hashtag. Our August conversation will be eclectic, reviewing on-the-ground and under-the-radar attractions in Mexico as well as Mexico on the Web, including social web channels Facebook, Flickr, Google+, Ranker, Slideshare, Twitter and YouTube. We will discuss current and upcoming events, recommended places, travel tips and tours, language classes and favorite foods including chocolate, mole and mezcal. Which Mexican park was recently added to UNESCO’s World Heritage List? Tip: the answer is on their Facebook page. In November which Mexican city hosts a congress for World Heritage Cities? Which Mexican churches are dedicated to the Assumption of the Virgin Mary? Which Mexican baseball teams are in contention in the 2013 playoffs? What’s your favorite professional club in Mexico? What’s your favorite colonial city in Mexico? Previous PostFairmont Mayakoba Launches An Exclusive Teens Room by Playstation®Next PostPesos? Dollars? How does it all work?